Tata Steel, pioneer of several HR innovations, believes in providing employees job security, career growth and work-life balance. Employees of Bhushan Steel were staring at an uncertain future after the steelmaker started defaulting on loans three years ago. The stiff competition between Tata Steel and JSW Steel to buy the bankrupt firm last year was little consolation as most thought the acquirer would have no option but to trim the workforce to reduce costs. However, after buying Bhushan in an auction conducted under the Insolvency and Bankruptcy Code, the 111-year-old Tata Steel took on board all 5,000-odd Bhushan employees, including those working on contract. The reason was simple - Tata Steel considers employees as its competitive edge. This is especially true at Bhushan where it is targeting an increase in capacity and a fast turnaround. Tata Steel, a firm believer in on-the-job training and empowering people, feels handing pink slips is a sign of weakness. "The strength of an organisation lies in the loyalty of its employees. Our organisation has up to fifth generation employees and this is due to the confidence that generation after generation has placed in the organisation and its value-driven approach," says Suresh Dutt Tripathi, Vice President, Human Resources. Apart from the legendary job security it provides to its employees, the steelmaker aims to be an equal opportunity employer by putting objectivity at every stage of an employees lifecycle right from hiring to career progression. The focus on improving lives of every stakeholder informs every decision that the company takes. The core principle of Tata Group, ever since it was founded in the 19th century, has been improving the quality of life of people and communities. As part of that, Tata Steel has pioneered several worker welfare schemes and community initiatives. In India, these include the eight-hour workday at the Jamshedpur plant in 1912, leave with pay scheme in 1936 and workers' Provident Fund Scheme in 1920 - all these were subsequently adopted by the International Labour Organisation and later included in labour and other laws in India. However, of late, the company's focus has been in restoring the work-life balance of employees. 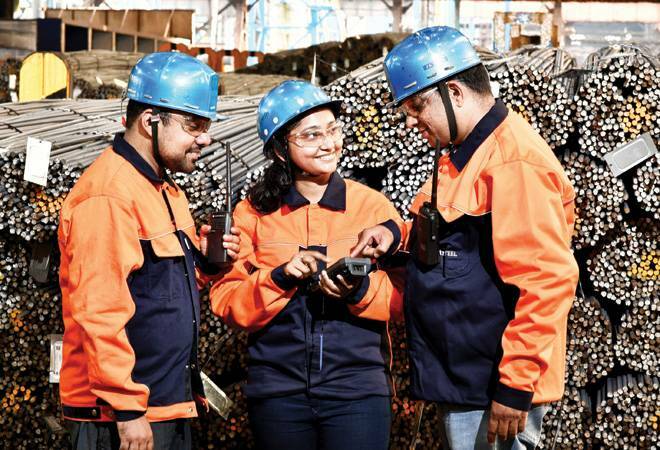 "Tata Steel is the employer of choice for the millennial populace and the Gen Z as it has been successful in enabling the young workforce to strike a balance between life and work," says Tripathi. Tata Steel was among the first company in manufacturing to implement the five-day work week and work from home, apart from a sabbatical policy, menstrual leave and paternity/adoption leave. In 2018, the company started the 'Take Two' policy to provide a second career option to women. The representation of women in India's traditional industrial sectors has been 3-8 per cent. At Tata Steel, 11 per cent of the 7,000 employees (white collared) are women, up from about 8 per cent two years ago. The company has set itself a five-year target of 20 per cent. The steel maker has launched several programmes under a diversity and inclusion initiative called MOSAIC. There has been a lot of focus on recruiting more women. Hiring partners get special incentives for every successful female hire. The company has launched a scholarship programme, Women of Mettle, for attracting female talent, especially in technical fields. It also runs a cross company mentoring programme called 'Tata Mentors' that trains high potential women executives. It also runs structured mentoring programmes for women. The number of women in top leadership has increased since the inception of these programmes. "We have been creating an atmosphere for enriching the lives of the workforce by meeting their needs and empowering them to contribute," says Tripathi. Skilled manpower has never been an issue for Tata Steel with its extensive modules and training facilities. "We are in continuously providing training and skills to employees. We recently launched a brand campaign, 'We Also Make Tomorrow', where the organisation has been positioned as contemporary, dynamic, youth oriented, to complement the conversations around disruption, innovation and new technologies," he says. Tata Steel is endeavouring to nurture a culture of diversity, innovation, total quality management and employee care and respect. It believes that diversity will enhance capabilities. "In all our global operating locations, we pride ourselves on being an equal opportunity employer," says Tripathi. Tata Steel encourages high-performance culture and supports it through various rewards and recognitions. "We strive to ensure a safe, healthy, clean and ergonomic working environment for employees, contractors and anyone affected by our activities," he adds. Innovation has been a key element in the growth journey of Tata Steel. The employees' innovative ideas are routed through an innovation platform. The Innovation Club, started by the HR Capability Development Department, has incubated 120 innovation projects so far. While compensation policies are on a par with the external benchmarks and in case of blue collared workers better than the external benchmarks, says the company, the perks, too, are not insignificant. For instance, Tata Steel provides company owned or leased accommodation at all locations, free medical facilities (even post retirement for employee and spouse), Mediclaim for dependents staying away from the employee, the Tata executive holiday plan, local club membership at subsidised rates and sporting facilities.